Knock, knock. Knock, knock. Do you have a late model Land Rover or Range Rover with independent suspension? If so, you've likely heard a strange noise when the front end of your vehicle suddenly changes direction. Think about speed bumps, pot holes or a driveway/entrance with a steep angle. Do you hear a strange knocking sound, or maybe even a loose steering wheel that doesn't quite feel right? Sounds to us like it's time for some new bushings. Luckily, Rovalution has you covered. The four wheel independent suspension design offers some major benefits, such as improved ride and comfort, better handling with heavy vehicles and of course, legendary Land Rover off road capability. However, the extreme forces that the suspension components incur will, over time leads to the bushings needing to be replaced. 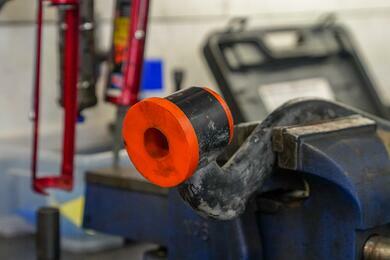 If those bushings are your problem, replacing them will immediately remove that irritating noise over bumps. Replacement of the bushings will also improve your ride, comfort and handling. 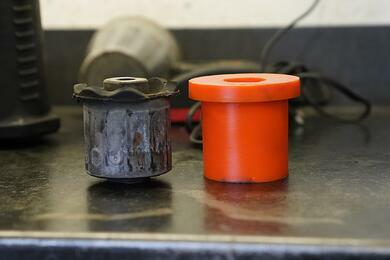 Here at Rovalution, we use the highest quality polyurethane bushing kits direct from Polybush. The reason we use these bushings over the OEM, is that the OEM is a rubber membrane filled with a fluid and overtime, that membrane will break down, stretch and crack - leading to the symptoms one of our customers was complaining of. As you can see below, after the bushing was removed we can clearly see a large crack throughout the bushing. Comparing the two below, you can see the stock OEM on the left with the much larger, single piece urethane bushing on the right. This single piece offers a noticeable improvement in ride quality and handling. Once removed, the new Polybush are slid into place and the lower control arm is reinstalled in the vehicle. 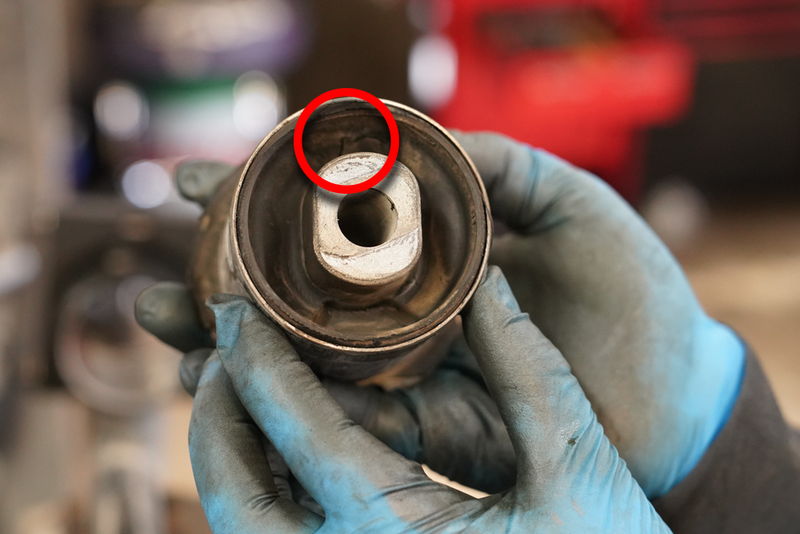 When completing the bushing install, we also install a new OEM ball joint connecting to the steering knuckle. 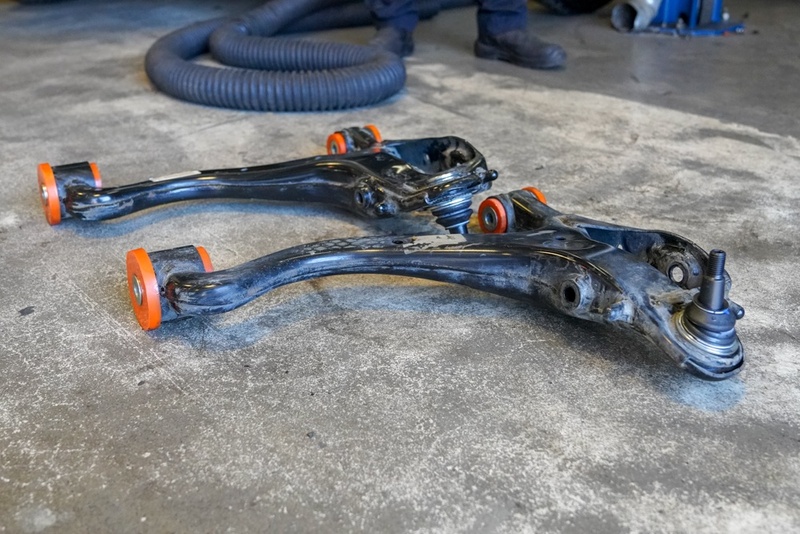 You can see the two completed lower control arms for an LR4 below with the two orange Polybush in each side and a new ball joint and now they are better than new. Customers will notice an immediate change in ride of the vehicle with the addition of Polybush. The most obvious of which will be the lack of knocking sound, plus the added benefit of a more controlled ride, much longer life than the standard OEM bushings and even longer tire life. We have install over a hundred Polybush kits and our customers have been thrilled with the results every time and not had a single complaint or issue. We've completed well over 100 of these Polybush kits for Land Rover LR3, LR4, Range Rover Sport and Range Rover owners over the years and each and every one sees an instant change. These Polybush kits make an incredible difference to the ride, comfort and quality of your Land Rover. Does your Land Rover make a knocking noise? Book an appointment with us and we will check to see the state of your bushings, and recommend the best course of action.